Occasionally, we put down the paint brush, hammer and skill saw to speak with folks about the community building power of a Better Block event. Over the past two weeks we were invited to the Greater Dallas Planning Council and Building Professional Institute. Presentations from both these events can be downloaded here: BPI 2011GDPC 2011. A common theme we are finding with these speaking engagements is that Americans need assurance that it is OK to go back on to the streets. The greatest public right of ways in the U.S., even greater than parks are our streets. Great places around the world blur the lines between public and private realms on streets. The fuzzy line of “mine” and “theirs” is where the actions is. 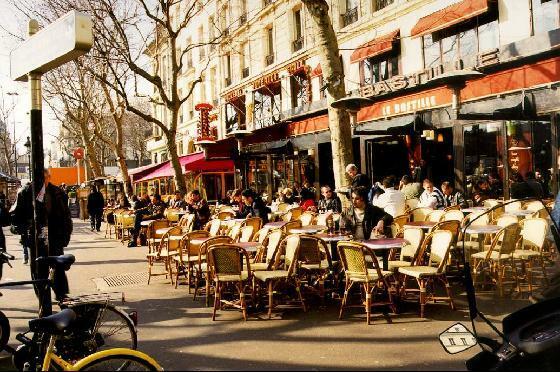 Cafe in Paris blurs the line between public and private. Sure there is paperwork, legal notices and council meetings to make Better Blocks the standard, but we need inspiration to get us over that labor. Starting revitalization with a Better Block stirs the spirit of citizens and motivates policy makers and staff alike to do the thankless work of changing codes and streamlining permitting. Thank you to all the planners, engineers, managers and policy makers that are leading our cities toward livable communities.